Pebble walkways are attractive and cost effective ways to create a path to a garden, shed or even a home. This makes it an ideal choice for homeowners looking for a way to improve their landscape. With some planning and hard work, you can create a pebble walkway yourself and save the money it would take to hire a professional. Mark your walkway with a heavy rope to create an outline. A typical walkway is between 30 and 48 inches in width depending on how often it will be used. However, you can adjust this to fit your needs. Dig up the ground about 4-inches deep within your outline with a square-edged shovel. Check the depth occasionally with a tape measure to ensure consistency. Spread the crushed stone with a rake about 1-inch deep in the prepared area. Make sure the stone is spread evenly to keep the walkway level. Lightly spray the stone with a hose, and then compact the stone with a hand tamper. The water will keep dust from rising, while compacting the stone helps consolidate the pathway. Cover the stone with landscape fabric to prevent weeds from growing in the pebble walkway. Keep the fabric in place by putting down spikes every 8 to 10 inches. 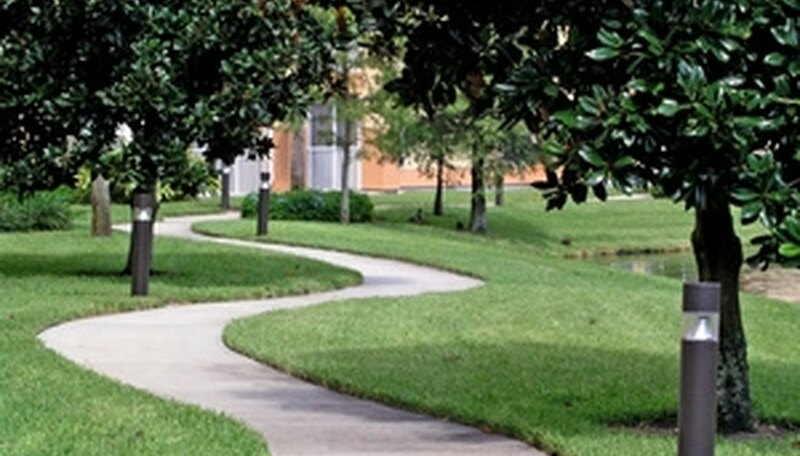 Place metal edging on both sides of the path to contain the pebbles within the walkway. Cut the edging with a circular saw so it does not continue past the walkway. Tamp metal edging using a rubber mallet until secure. Add the pebbles to the prepared surface and spread with a rake. Avoid piling the pebbles too high so they don't spill over the metal edging. Paint the fence with vinegar. Do this on a dry day. The acid in it will create tiny pits in the stone, which in turn will make a home for the microbes that will tarnish the stone. Stain the wall by randomly and lightly dry-brushing antiquing glaze into crevices, if you want to achieve an aged look more quickly. Don't paint the entire wall. Let dry. Reapply more vinegar, if desired. Grow moss on the stone. Daub yogurt or buttermilk onto the wall, especially in the cracks. Patting the yogurt or buttermilk with a bit of soil helps moss to take hold. Moisten the fence with a mist of water every day until moss is established. Reapply vinegar periodically to speed the natural aging process. 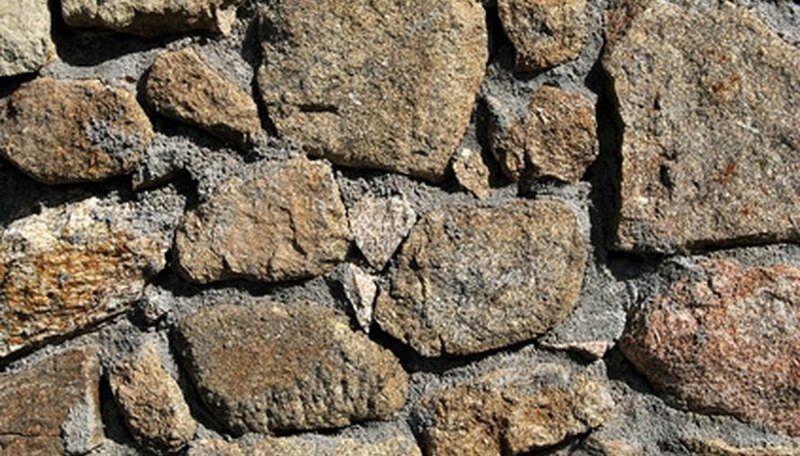 Stone siding is the most obvious way to incorporate stone into your home exterior. Natural stone is durable and attractive although it is also quite expensive. Limestone, sandstone and granite are common options. Stone veneer siding, also known as faux stone siding, is a more affordable option that still provides the stone appearance. According to CalFinder, stone veneer is made of cement and other natural ingredients that are mixed and molded to look just like stone. The average cost is $11 to $15 per square foot, as of September 2010, which is still much higher than other siding options such as vinyl. For a smaller stone exterior addition, pave your driveway with stone. As noted at Driveway Tips, stone driveways are common in rural settings and make a good choice for long driveways. The average cost is $1 to $4 per square foot. Although a stone driveway is aesthetically appealing, it does require frequent maintenance and upkeep since stones can shift easily. Line the driveway to help keep stones in place. A stone chimney is a subtle way to incorporate stone into a home exterior. As noted at Moonstone Masonry, a stone chimney helps to visually anchor the house while adding very attractive color and textures. Stone chimneys are commonly used for log cabins but also look attractive paired with other siding options. You can either use natural stone or a stone veneer for your chimney. In addition to the home exterior, a stone chimney also incorporates stone into the interior since it is typically attached to a stone fireplace. There are several ways you can use concrete as a walkway material. A standard poured walkway offers a bright and sturdy front walk. You can add color to the concrete to give it character and a unique look. Mix in different colors to give a look of marble or other stone. Stamped concrete can give the look of an expensive stone walkway at a lower cost than installing actual stone. You can also leave decorative impressions in your concrete with items such as seashells, or mark the date your family built the walkway. Lay a layer of gravel in your walkway path, and then create your walkway with a decorative stone. Brick can create a colorful and durable walkway as well. Other kinds of stone include granite, slate, brownstone, limestone and sandstone. Each kind of stone offers a unique texture and color. Be sure to choose a stone that matches the color scheme of your yard. Pack the stone tightly when installing it to help prevent cracking with age. Crushed stone offers color to a front walkway, but it is not as stable to walk on as stone blocks or concrete. 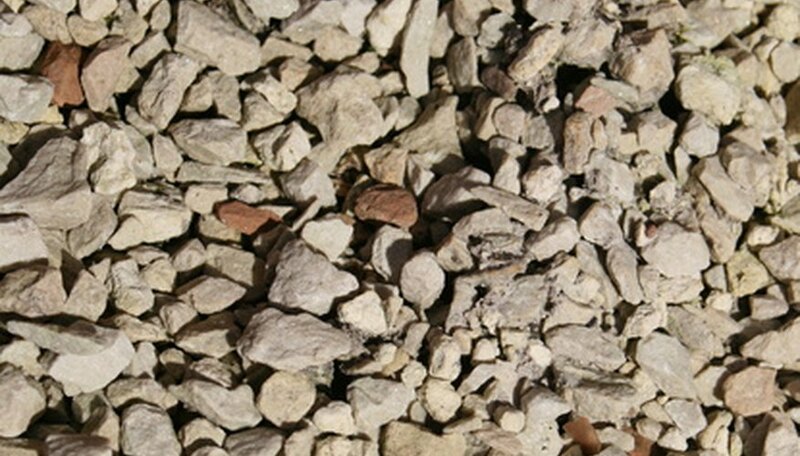 You can get crushed stone in a variety of colors including white, pink, blue and gray. When installing a crushed stone walkway, be sure to dig a walkway outline at least three to four inches deep. Fill in the walkway up to the point where it is flush with the ground. Packing the stones in tightly will make them easier to walk on. Mow the lawn before you begin. You'll have to take up the grass before you lay landscape stone, and a cleanly mowed lawn makes this job a little easier. Check the dimensions of your project. If you're doing a large-scale project this is more important than a simple walkway. Grounds-mag.com suggests adding 10 percent to your dimensions if you're working on an area with lots of curves. Lay out the landscaping stone in the pattern you desire for a walkway. Check to make sure you're satisfied. Cut around the edges of the landscape stone with a knife. Pull the stone away and take out the grass that lies beneath the stone using your knife and spade. Pour crushed rock in the hole you created. Crushed rock will prevent your stones from sinking into the yard. Use a spade to remove the grass for the entire area of the patio or large project you're planning. Laying the stone directly over the grass won't stop the grass from growing. Cover the area with crushed rock, making a 4-inch thick base. Spread sand over the crushed rock. Now you can lay your landscaping stone in the pattern you desire. Place your stone tree surround in place around your tree. At this point, simply lay it on top of the grass. Cut around the outside of your stone tree surround with your hand shovel. Don't try to remove the grass yet; simply make the cut. Remove the stone tree surround and set it aside. Remove the grass from around the tree inside the cut area. In some cases, you may need to use your hand shovel to pry up the grass. Shake excess soil onto the exposed ground. Set your stone surround in the area where you have removed the grass. Mulch or plant flowers in the area between the surround and the tree trunk. Crusher dust compacts very well, creating a stable surface. Instead of going to waste, it is used to make walkways, bike paths and parking lots as well as to create a supportive, level surface under concrete driveways and patios. It should not, however, be used under concrete pavers -- bedding sand is best for this application. 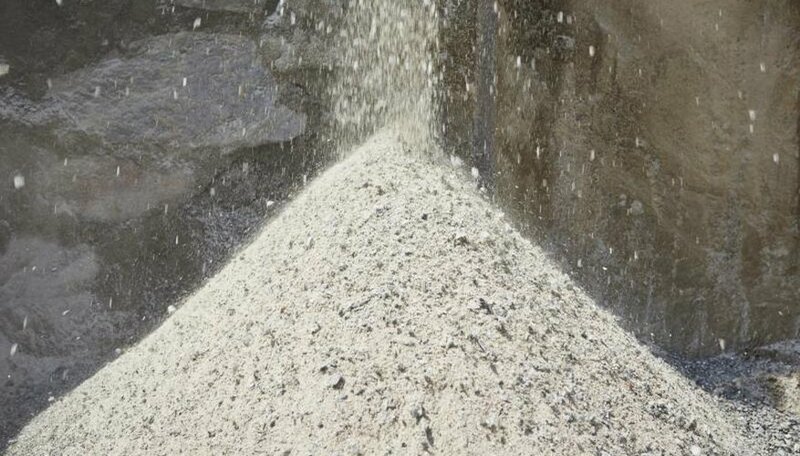 Crusher dust is also used to make concrete aggregate, concrete sand and glass insulation. In addition, it is frequently used as fill in trenches and around water tanks. In agriculture, the material can help aerate soil. Measure the length and width of the area you wish to fill with crushed stone. If you have a curved or circular space, measure the tightest square area around these spaces. Determine the type of stone you wish to use for the space. Larger stone will take up more area, so you'll need less of it compared to smaller stone. 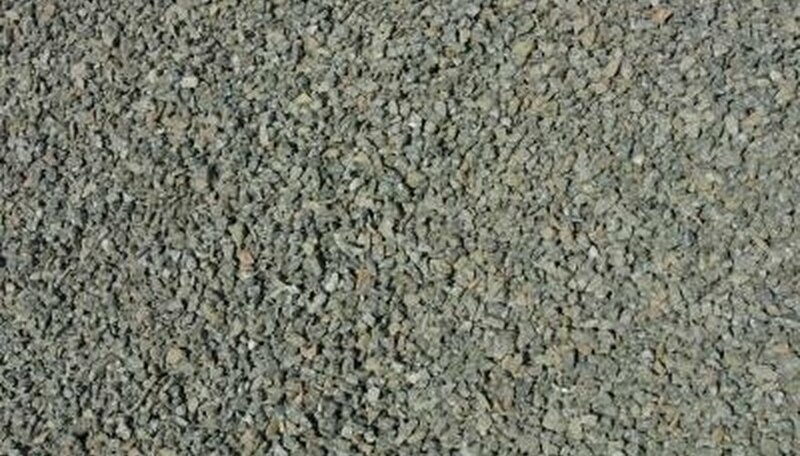 Ideal crushed stone is less than 3/4 inch in width. Look up a crushed stone calculator online, or use the one provided in the Resources section of this article. Enter the length and width measurement you measured in Step 1. Enter the type of stone you'll be using, if asked. Enter the desired depth for the stone. This is essentially how thick the layer of stone will be once it is laid on the ground. Press "Calculate" and the results will show how much stone you need for the space in either cubic yards or tons, depending on the calculator.